The exact boundaries of the kingdom of Elmet at any particular time cannot be known for certain, but this map attempts to show the regions involved. 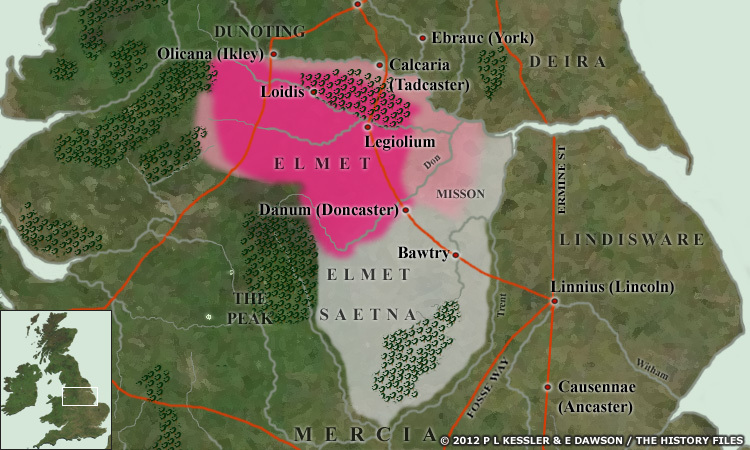 The deep pink area is what should be regarded as the probable extent of Elmet in its final twenty years - the period between the death of its great champion, Madoc, at Catterick in 598, and the fall of Elmet when Edwin of Northumbria invaded in 617. The lighter, carnation pink area is made up of uplands, marshes, swamp, fens, and fen carr (wet forest). This would be marginal land not controlled by the Angles, but only marginally inhabited by Britons. The light grey area is the probable extent of British territories which possibly became part of Elmet, soon after the expulsion of Roman authority in AD 409, although it cannot be said for certain to which kingdom these territories all belonged. Original text copyright © Edward Dawson, P L Kessler, and the History Files. Go back, or return home.